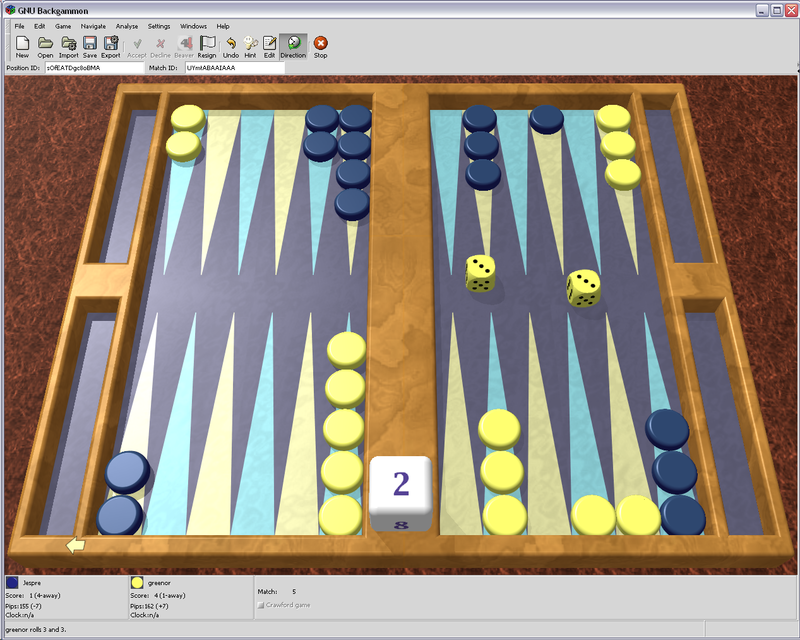 Would someone please build a package for GNU Backgammon: http://www.gnubg.org? Apparently if you know what you're doing it can be compiled with 3D support and overall looks way, way cooler than KBackgammon, or any other computer backgammon game I've ever seen. I tried, but apparently I don't know what I'm doing. I've built package for this right now. It is working just fine, although I would like to test it more further. The problem is - where to upload it? Today I sent message to JohnB316, I am still waiting for reply. The package is 16 MB. Thanks a lot Bender ... uh, I mean kukibl! I think JohnB316 is pretty busy right now, so if you don't hear from him soon, try messaging exeterdad, I've seen him posting about new packages a lot lately. I will build it one more time, on a "clean" system this time and test it. I will PM exeterdad tomorrow if I don't get reply from JohnB316. I'm afraid I'm not going to be able to help you to sign up as a packager I'm certain I can't get you into the packagers forum, though I'm a "moderator" of sorts over there, I don't have access to the magic wand to modify your account. I'm also unsure what my "repo" rights are. I'm sure glad to see your eagerness and willingness to help though The more people we have on board makes for a more complete repo. And of course you may have ideas for apps to package that we haven't even thought of. I must warn you that our packaging standards have tightened up considerably since the packaging "how to" was written. Just recently we've cracked down even harder, and a new slackbuild template created. A new "how to" is being written as time allows. But if you are able to compile and install for yourself, you already gotten past the hardest part. JohnB316 will get back to you as soon as he's able, he's a good guy. BTW thomh38.... to get 3d support with gnubg, you need to have gtkglext installed. Otherwise it will quietly build with 2d support no matter what options you pass to ./configure. Thanks for clearing things up. I hope this heps kukibl, as he seems to me to have "the right stuff" for a packager (maybe someday I will). I only got interested in this because somebody else was interested in a backgammon game for Linux, and then I found GNU Backgammon and it looked so cool. I don't even know how to play backgammon. I suppose I deserve the hat. Backgammon is a really nice game. I like it because has some complex things but is not so demanding as chess. I have always liked backgammon, easy to lean, but the element of chance and how a skilled player can make the chance work to their advantage makes it a fascinating game. Certainly gnubackgammon looks good. Let's see ... we've got Argentina, Serbia, the UK (Wales represent! ), the US ... World Tournament anyone? Okay, exeterdad and I don't know how to play, so that would kind of make it like the World Cup. No problem, I understand. Maybe one day in the future... at least I hope so. Thank you for reply and for clearing things out for me. I don't know how to play it either. I've decided I'm going to learn backgammon. I think it would actually be fun to have a VL backgammon tournament (Backgammmon Unreal Tournament 2008!) ... seriously though, how would we do it? I know we don't need GNU Backgammon. It would be nice if somebody packaged it, but if not, not (I can see how it isn't a priority). So what's the status then. Is it NOT packaged? Did kukibl give up? Hope I didn't discourage him! I did a quick and dirty package for proof of concept. It runs in 3d but crashes with ATI cards from a bug in gtkglext.